I like work-themed bikes. I’ve always said if I got my hands on a Big Ruckus, I’d turn it into a military messenger bike. 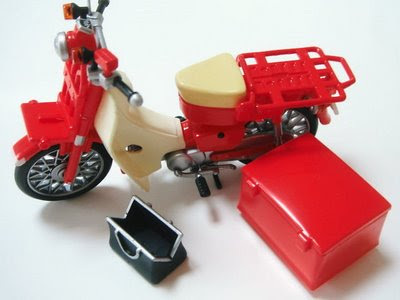 Well, if I got my hands on a cub, I would undoubedly spend untold hours and dollars begging my friends Aki and Kuroneko to ship me parts to transform it into a MD90, Japanese Postal bike. Complete with single seat, massive topcase and that little medical looking bag on the front rack. There are a number of other subtle differences… and of course, I’d wanna capture each and every one. Aki tells me that the special edition Honda postal scooters are never sold to the public. Some people will build them from standard Cubs with bicycle parts, some sell them grey market. If you are into that sorta thing, I’ve got some sites for you to see (thanks to Aki and Kuroneko… though they should know better than to encourage me). Here’s another restoration / conversion page where you can see some rim details. 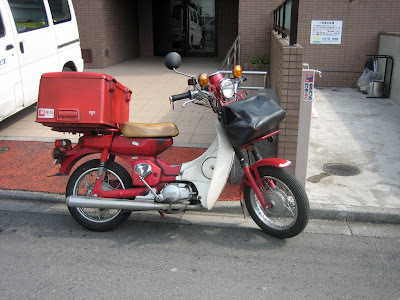 Yuubinbike.com has some nice MD90 owner photos and a little section called “I like post office bike”. Here’s a used “Red Beet” postie for sale. It’s a more modern design (1982). Honda build limited numbers of these “Red-Cub” scoots as a tribute to the official MD service bike. If you are doing a conversion, you might be lucky and find parts on a Japanese Yahoo Auction. Until I do get my hands on a cub, this is about as close as I can get to owning an MD90. There are other great “professional” uses for the cub… Noodle delivery? Buy your equipment here or here. Do all the mail carriers in Japan look like her? I love the video, so precise. TGB sells its food-delivery scooter in the U.S. (big, built-in, insulated box on the back). Have you checked out the new photo book, "Bikes of Burden" by Hans Kemp? I haven't myself, but it looks pretty cool. D'oh. I didn't see that. The pic of the "cub" behind the post office? The "cub" pictured there is apparently a YAMAHA. Just thought you should know. at least it's more credible now two of us have said it!